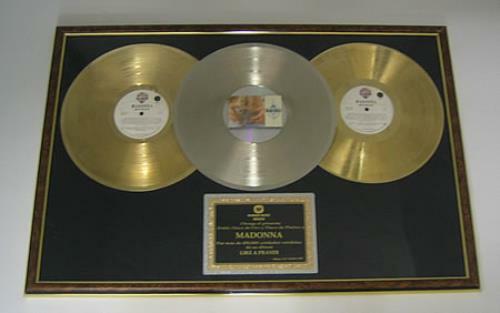 MADONNA Like A Prayer (Rare Official Mexican Warner Music Mexico In-house 'doble disco de oro' double GOLD and 'disco de platino' PLATINUM sales award disc issued to commemorate album sales in excess of 450,000 copies in October 1992 and presented to Madonna . This nicely framed and glazed award measures 31" x 21" in size, and features TWO gold vinyl LP discs with ONE platinum LP disc in the centre with a CD and album artwork miniature in the middle, mounted above the authentic custom printed black with gold text dedication plaque with a gold & platinum outer border, all text in Spanish - all mounted on a black matt background with metal and wood effect frame. Stunning item and the first Mexican Madonna vinyl award we have ever had! ).